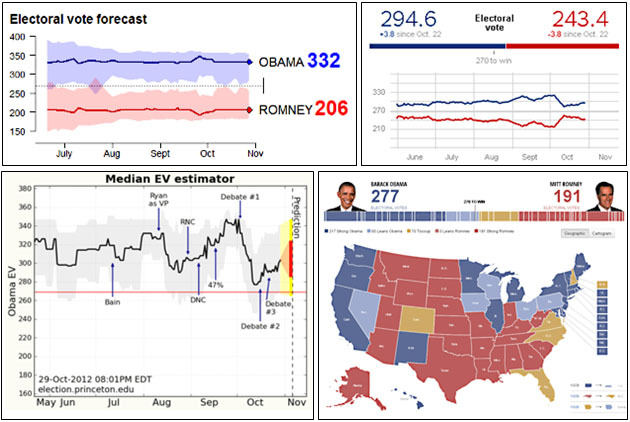 It’s a week until Election Day, so here’s an update on the status of the four most popular presidential forecasting models. On the top are Drew Linzer and Nate Silver; on the bottom are Sam Wang and Pollster. Obama has been widening his lead since about October 10, and is now the favorite in all four models. The average of the models gives Obama 301 electoral votes. Accordingly, you should expect much mud to fly from the Romney campaign over the next seven days.